If you dream of going to great lengths for your bridal style, Gracie is the gown for you. 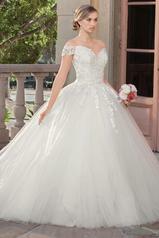 With a royal length train that extends elegantly down the aisle, this ballgown makes a big statement. The dropped waist is a flattering offset for the fuller nature of the tulle skirt, while the off-shoulder lace sleeves, heart-shaped illusion back and deep sweetheart neckline offer a contemporary touch.